Ciao from Florence! In case you haven’t been following along on Instagram, I’m travelling Europe for 3 weeks right now with some of my best friends right now, exploring Italy, Switzerland, France and England. 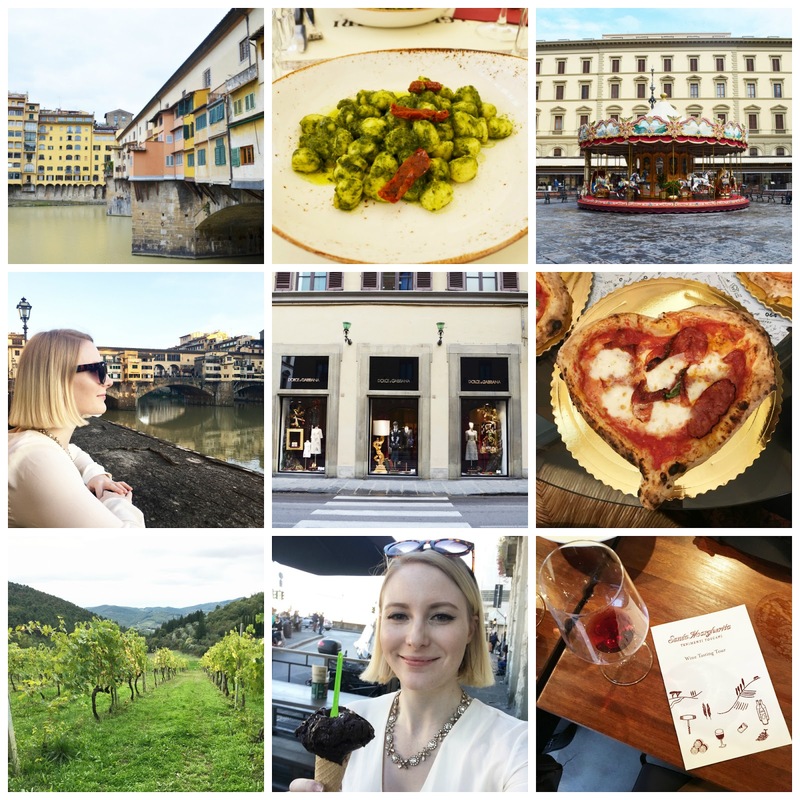 We’ve spent 4 days in Florence, eating our hearts out and drinking wine for the most part. Our hotel was blocks away from the famous Ponte Vecchio, which is lined with Florentine gold shops selling all kinds of jewellery and watches. Just on the other side of this bridge, we discovered this beautiful arched walkway to take some photos. The walkway lines the side of the Arno river and have a beautiful view of the buildings that line the river on the other side. It was a great little spot! Also just blocks away from the best panini shop, according to one of our group, who lived in Florence for 6 months. It was one massive panini, let me tell you. We also joined a Chianti wine tour and headed out into Tuscany visit two wineries in the area. The vineyards had amazing views of the countryside, and it was neat to try wines specific to the region, including the Black Rooster. You can check out my day in Instagram photos below! The weather has been phenomenal in Florence, with temperatures reaching 25 degrees Celsius, so coats were definitely not necessary. I wore my super-comfy high-waisted pants with a cute blouse I picked up from Simons before the trip. I love styling black, white and camel! It’s always a winning combo. The pants are quite long, so I needed to wear heels, but with the old cobblestone roads I wasn’t sure how I’d fair in high heels. I ended up wearing my chunky-heeled leather ankle boots and they worked just fine. You just have to watch your step! Stay tuned, I have another day of photos from Florence coming next week, and then we’re on to Switzerland.